"Nursing Buttons - 3" by Normadeane Armstrong Ph.D, A.N.P. 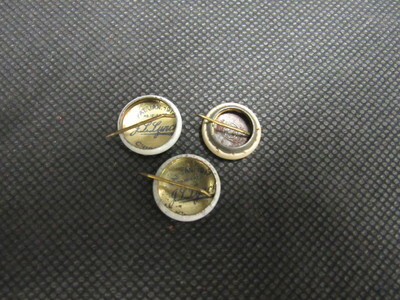 Nursing Uniform Buttons, ranging from about the American Civil War to the end of World War One. These buttons are made from an array of materials. The three white buttons with red crosses are marked on their backside. Two out of three are marked with the following phrase: "Pat. Jan 1917 No 1215675 J. L. Lynch Chicago Ill." The box holding the buttons was produced by E.C. Simmons Keen Kutter Junior and is made from leather and felt.